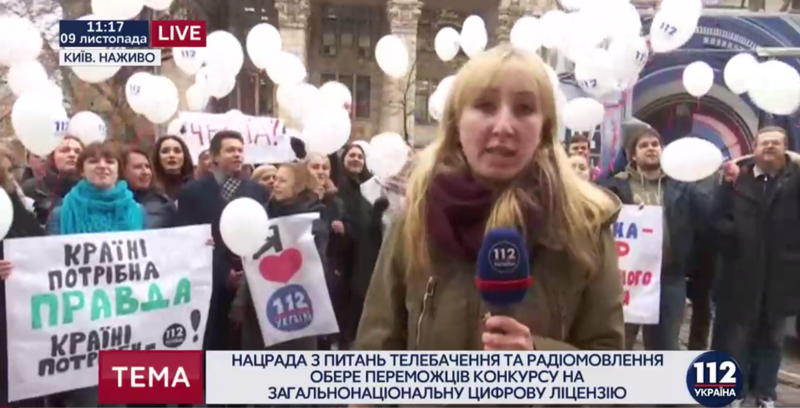 Employees of 112 Ukraine TV channel gathered under the walls of the National Television and Radio Broadcasting Council, where they await the results of the competition for licenses for a free nationwide digital channel. This was reported by the correspondent of the channel from the scene. "Our colleagues are already watching the meeting inside, we are here and waiting for the decision of the National Television and Radio Broadcasting Council - what will be the decision and whether 112 Ukraine TV channel will be the winner. Our TV channel staff, recognizable people - they all are rooting for the 112 TV channel to win," the reporter said. Journalists gathered under at the National Council building, as there are fears that the contest itself is aimed at the parliamentary television channel Rada. In a letter to the Speaker of the Verkhovna Rada, Andriy Parubiy, the National Council head Yuri Artemenko suggested on July 1, 2016 to consider the issue of obtaining a license for digital broadcasting for the Rada TV channel. The parliament provided for the purchase of equipment for the transition to digital long before the announcement of the competition. Now many industry experts and even some people's deputies are sure that the contest itself is a screen and a formality in order to legitimize the victory of Rada. As it was reported earlier the 112 Ukraine TV channel, an informational broadcasting leader, signed a memorandum with five digital broadcasters of the 112 Ukraine group on cancellation of license on broadcast after winning the tender by the Television and Radio Broadcasting Council for granting a license for a national TV-channel in MX-5 multiplex with the informational broadcasting format in DVB-T2 standard. It is expected that the National Broadcasting Council will announce the winner of the tender on November 2. The 112 Ukraine TV channel together with four other companies participated in the conquest. In contrast with other participants, the victory of the 112 Ukraine will mean not only expanding of broadcast of a reputable Ukrainian TV Channel, but also the additional liberation of frequencies in MX-5 TV-network, which is put out to tender and with analogous overall coverage all over Ukraine. This will allow announcing additional tenders for other broadcasters. None of the participants have this competitive advantage. Licenses of the 112 Ukraine TV channel are a source of conflict from the National Broadcasting Council during last four years, who issued 26 refusals to reform the TV channel’s program framework for information broadcasting mode, referring to various problems, while reissuing licenses to the 112’s direct competitors. From the side of Ukrainian and international politicians and experts, this approach caused accusations of political bias from the regulator, and the steps of the Council are deemed to be attempts to interfere with the 112 Ukraine TV Channel’s editorial policy and its change of owner. During previous year, the regulator’s policy towards the 112 Ukraine TV channel was of random and discrimination approach which is nothing but derogation of freedom of speech. Yury Artemenko, the chairman of the Council, earlier said that he will put the most efforts for 112 does not get the license. By signing the memorandum the 112 Ukraine TV Channel as the most popular informational TV-channel in Ukraine is ready to take a step further despite the previous unfriendly acts from the Television and Radio Broadcasting Council. The signed memorandum, that comes into its force from the moment of the 112 Ukraine TV channel wins the tender, allows to start relations with a blank sheet and will become the best demonstration of political impartiality of the Council and repel accusations in fictitiousness of the tender.